Lest you think I have given up the ghost, I thought I better show up here today and let you know I am alive and well. 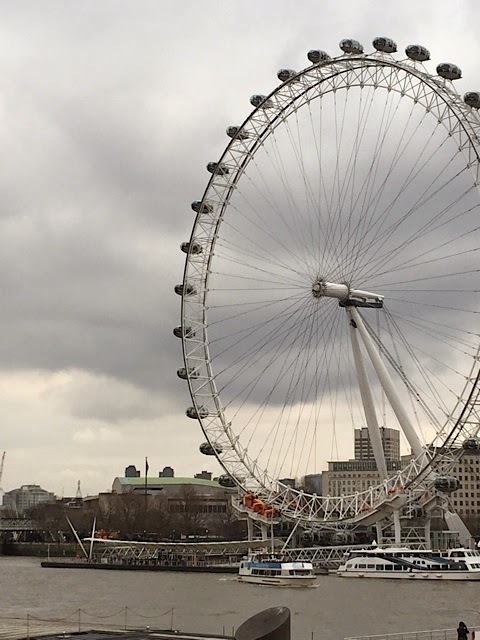 My absence was due to the fact that we went just spent almost 2 weeks in London and Paris over the Easter break. For those who follow me on Facebook or Instagram you will have already seen a few of these pictures, so please bear with me while I share a little about the journey. 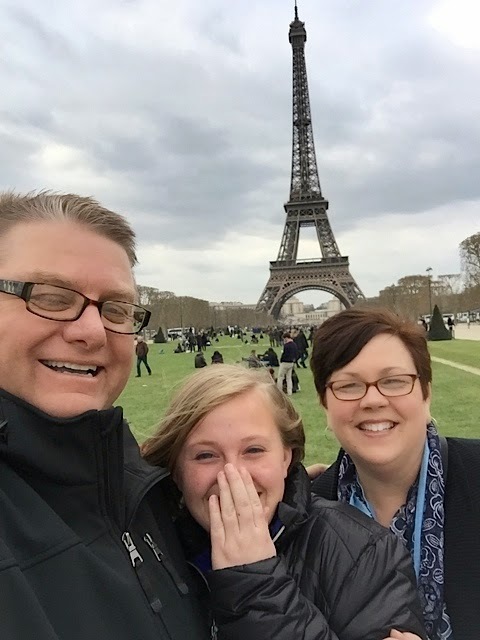 We promised our niece Britney we would take her overseas (first time), to a city of her choosing (just like we did for her little sister Maddie, two years ago). Britney picked London and Jay and I added Paris since we wanted to ride the Eurostar train that travels across the English Channel. Looking back I wish we would have stayed a little longer in London, but that gives a a reason to visit again. As you can imagine, we went a lot of places and took a lot of pictures, so I will only give you a highlight or two of what we saw and did. Hopefully I won't bore you to death. 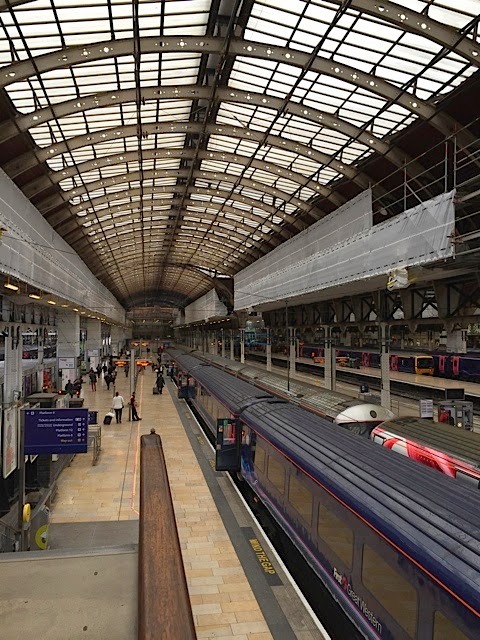 First stop after arrival, Paddington Station to take the train to Windsor Castle. The day was a bit overcast but still beautiful. We loved seeing the giant (and I mean giant) dollhouse and the grounds. We also met up with the lovely Brenda Brown for hot chocolate at the Windsor Starbucks. I have known Brenda from The Vintage Journey blog for at least a couple years, so we thought we would meet in person since I was going to be so close to her home. What a nice surprise to find that she is just as lovely in person, as she is in blog world. The next day we were off to the British museum to see the mummies. I have always wanted to see the mummies so I was the one that dragged everyone there. 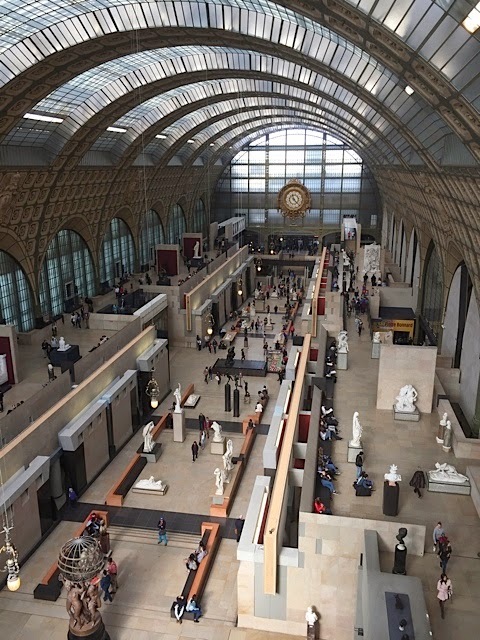 Turns out it's a spectacular museum! So much to see and yet we could only fit in about 3 hours before we needed to move on for the day. This is one of my favorite pictures of the trip. 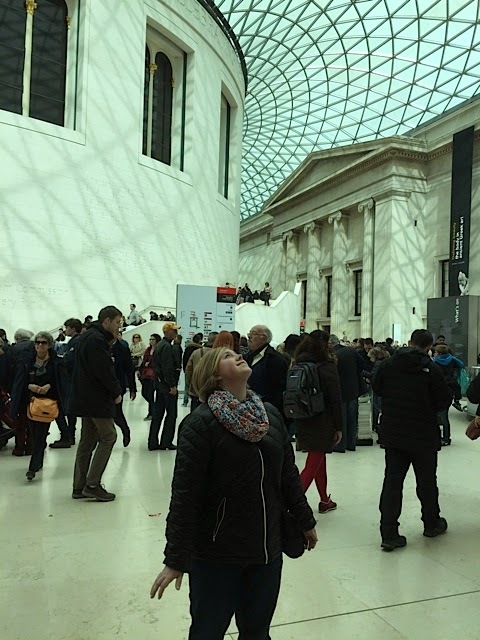 We had just walked in and she was staring at the beautiful glass ceiling. No staging here...just joy. We walked around town, shopped at Cath Kidston, got caught in a rain shower and had hot chocolate to get warm. 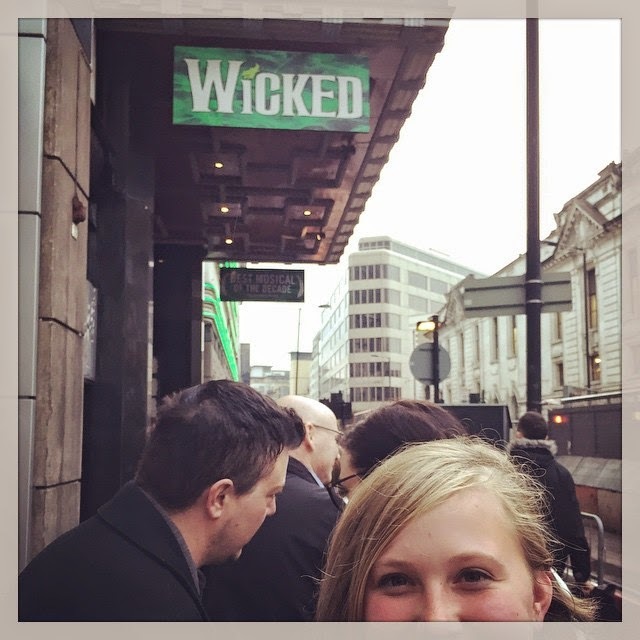 We ended the day by surprising miss b with tickets to see Wicked. She had never seen a big production play before so this was a huge treat. What a great night for all of us. The next day we were up super early to meet our tour that would take us to the Tour of London to see the crown jewels (another thing on my wish to see list). Then a boat ride on the Thames, Buckingham Palace (bigger than I thought it was going to be) and St Paul's Cathedral which has a huge gold dome, that unfortunately cannot be seen in the picture below. 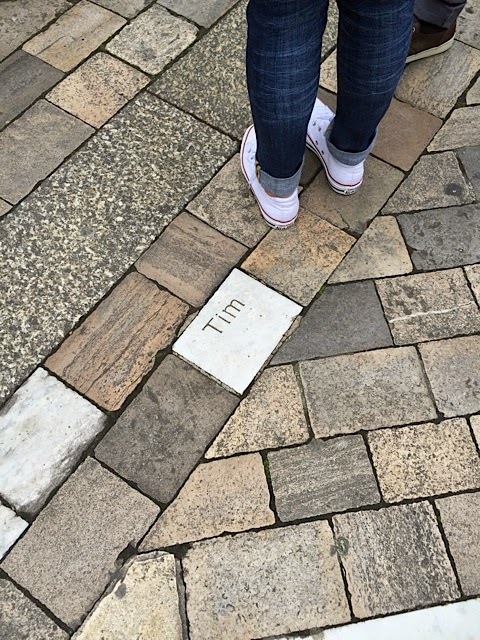 Out of literally thousands of pavers in front of St Paul's, only one of them had a name on it. I wonder if it was a sign? 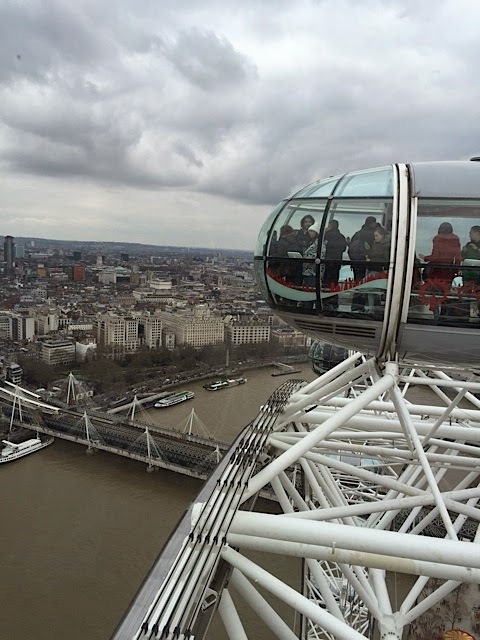 Lets see, after that we stopped by Parliament and Westminster Abbey and then on to the London Eye. 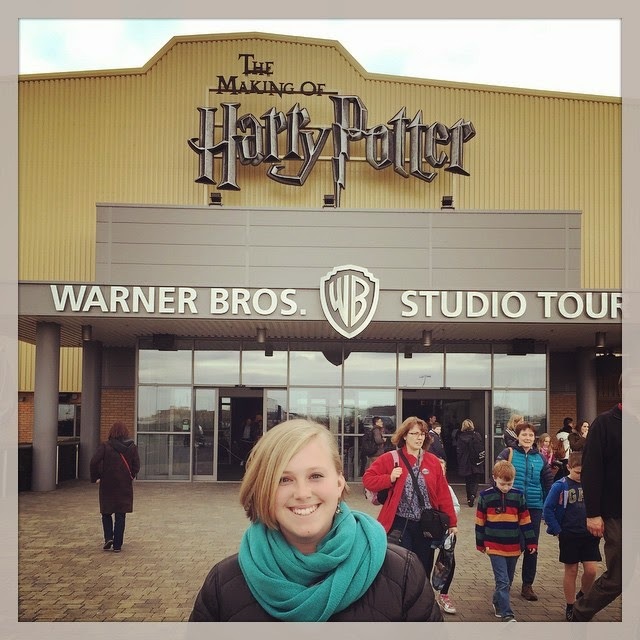 The next day we took a bus about an hour outside London to the Warner Bros Studio where Harry Potter was filmed. Another surprise for miss b who is a fan of the books and has read the series more than once. The online recommendation was 2-3 hours to do the tour. We were there 3 1 /2 hours and felt rushed to get to the end. Way better than I thought it would be. Very interesting as far as set decoration, "how did they do that?" 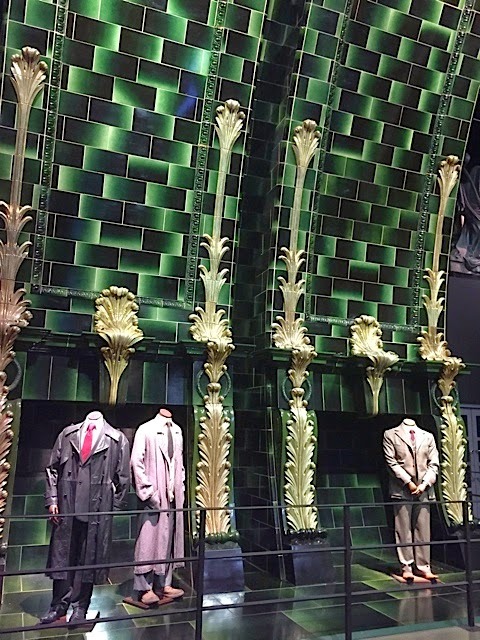 kind of stuff, and seeing the real sets/costumes in person. 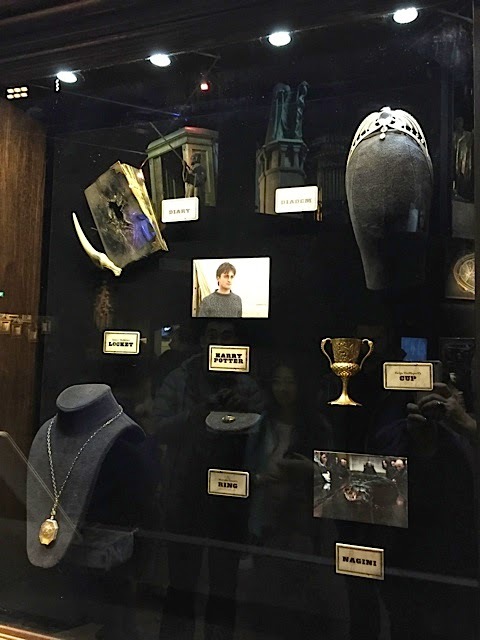 The studio had everything from the Great Hall, to the sorting hat, Dumbledore's office, the Covered Bridge and the Knight Bus...really, every significant prop including all the wands and the Horcruxes seen below. Absolutely fascinating stuff if you like the book series. 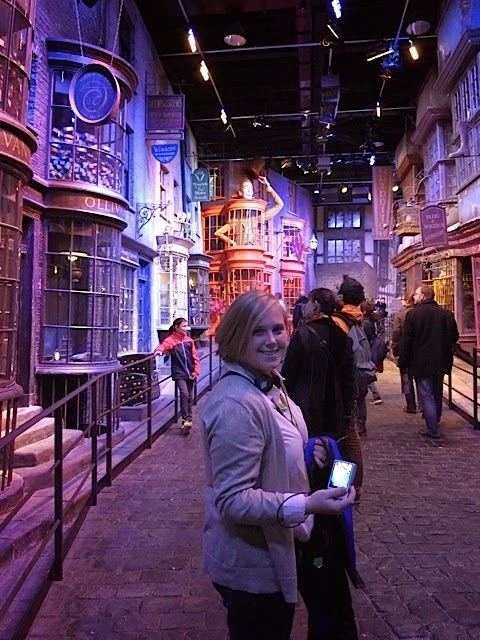 Diagon Alley...talk about attention to detail. 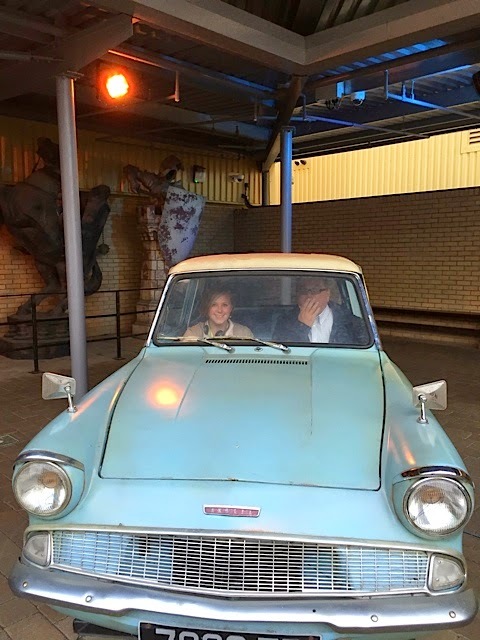 Oh and the flying car too. What a great way to end our London portion of the trip! 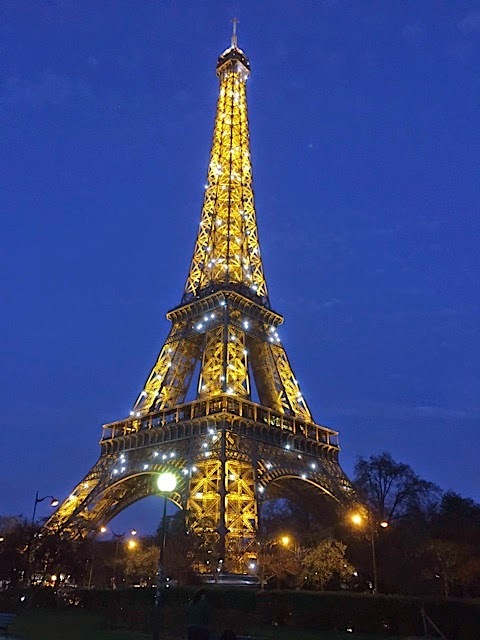 Now on to Paris...first stop, the Eiffel Tower of course! 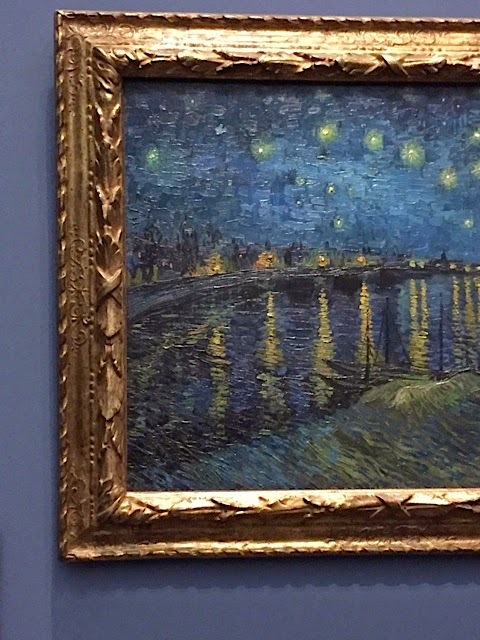 to see some of my favorite paintings...“Starry Night over the Rhone,” by Van Gogh (a forerunner to the more famous, "The Starry Night" painted a year later). And his Self-portrait from 1889. The photo does not do the color or texture of the painting justice. 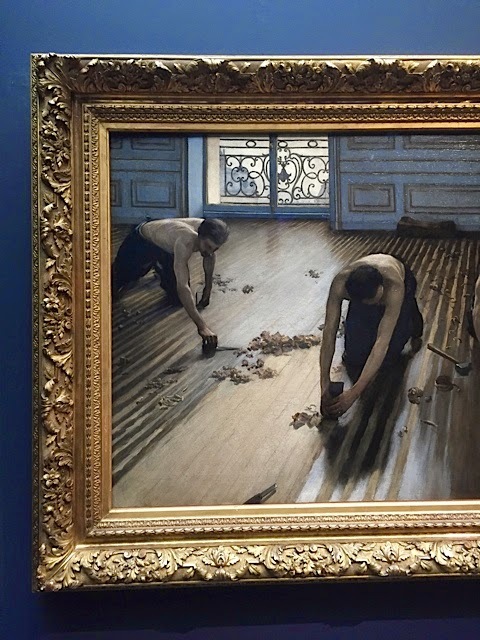 I was happy to see "The Floor Scrappers" by Gustave Caillebotte hanging on the wall again. 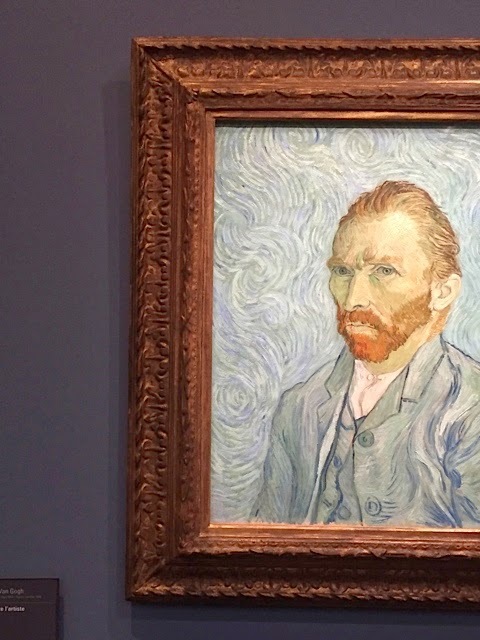 It was out on loan when I was in Paris 2 years ago. Something about this painting I find fascinating. I think it has to do with the light coming from the window and how I shines onto the floor and the backs of the men laboring. I know Caillebotte has much more famous paintings of Paris street scenes, but I still like this one best. 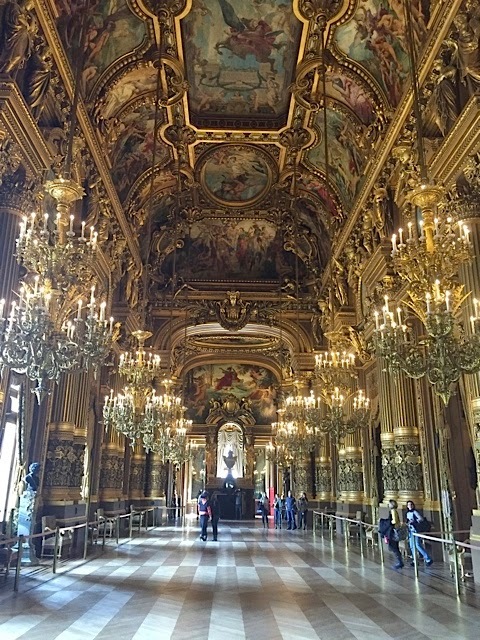 After the museum were off to tour the Opera Garnier. I have been here before, but our guide was so knowledgeable that it was worth another visit to learn more details. We were even lucky enough to see the grand hall with hardly anyone even there. 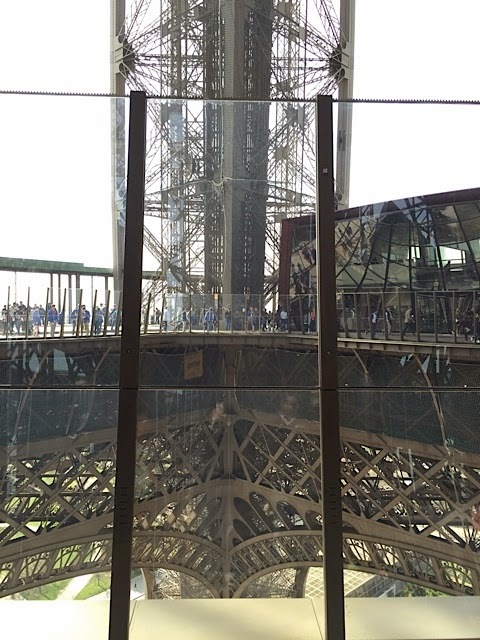 They have created a glass barrier or wall so you can look right down the center of the tower. 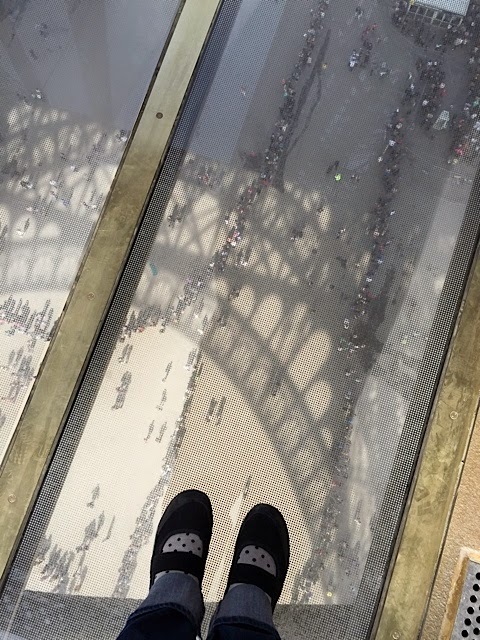 And on each corner there are glass pieces you can walk on. See all the people in line down below? We had a good time taking pictures on the glass and watching people when they walked out on it. 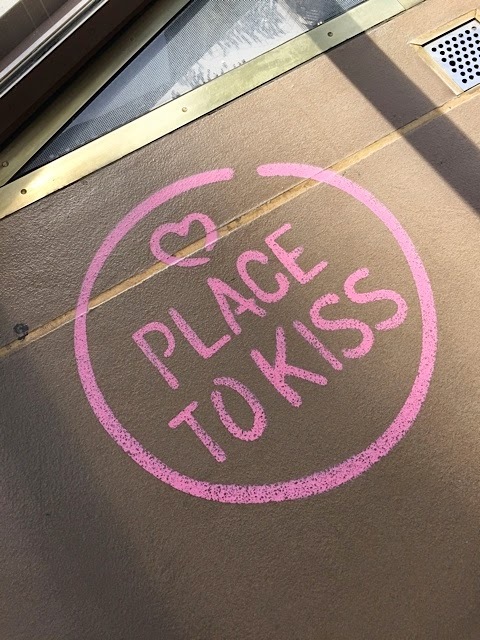 They even have a place to kiss (like France needed that). I thought the price was quite reasonable because we all know you could easily spend that much on lunch at Disneyland. We got the main + dessert combo. 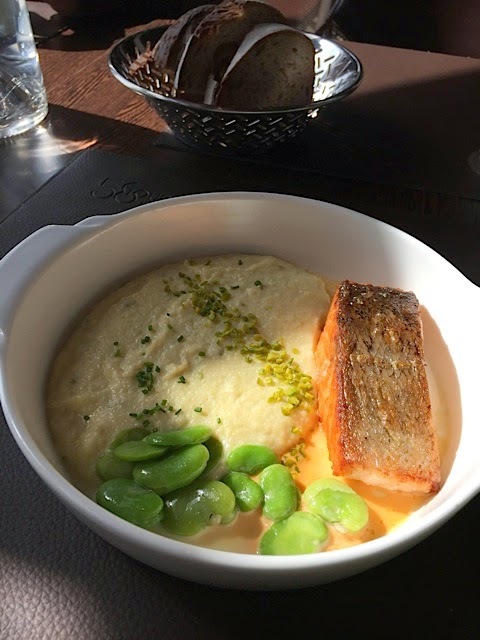 I ordered the salmon with polenta and broad beans. Seriously the best polenta I have ever eaten (I am quite sure it had a pint of heavy cream added, lol). Dessert was panna cotta with Passion Fruit puree on top, miss b had chocolate mousse and Jay had creme brulee. All were wonderful. 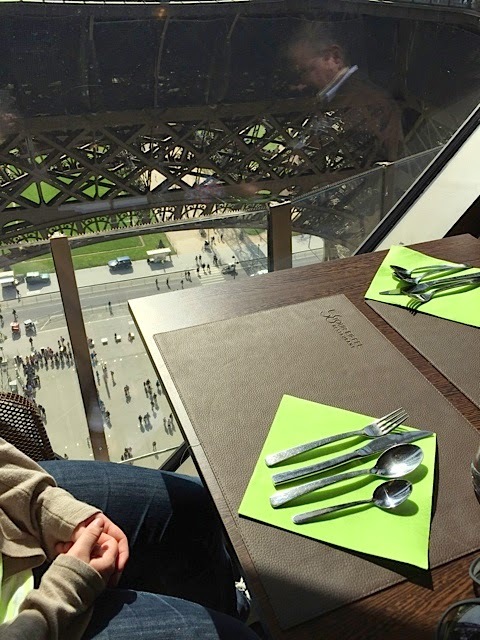 I keep talking about the food and have not even mentioned the view. From the picture above it looks like there is an open wall, but it's really glass and all enclosed. You cannot fall over the side or throw food down to the people in line, but it would make for a great story! 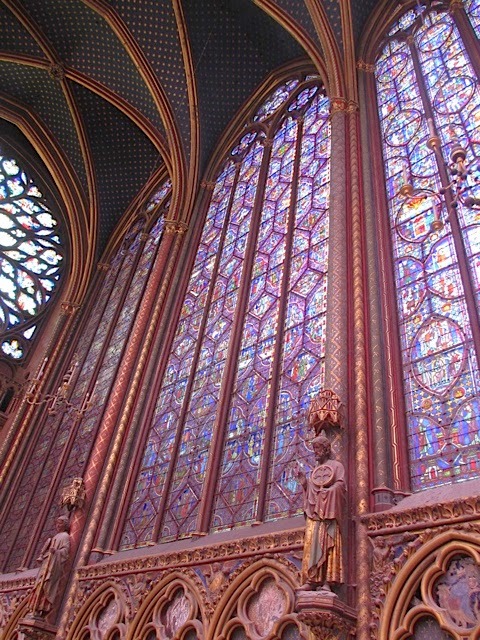 We ended that day by visiting Sainte-Chapelle, my favorite church in Paris. 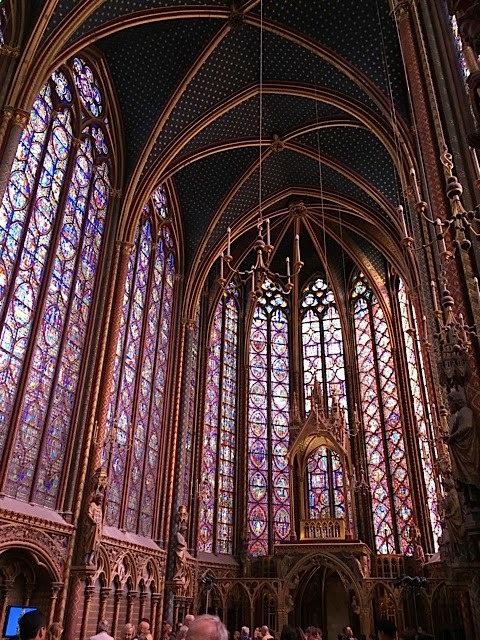 They windows are stunning. Two years ago one side was being restored...now it is done, so all the windows are free from scaffolding! We saw many other things like the Louvre and Chartres Cathredral (about an hour outside of Paris) to see the monumental screen that surrounds the choir stalls. 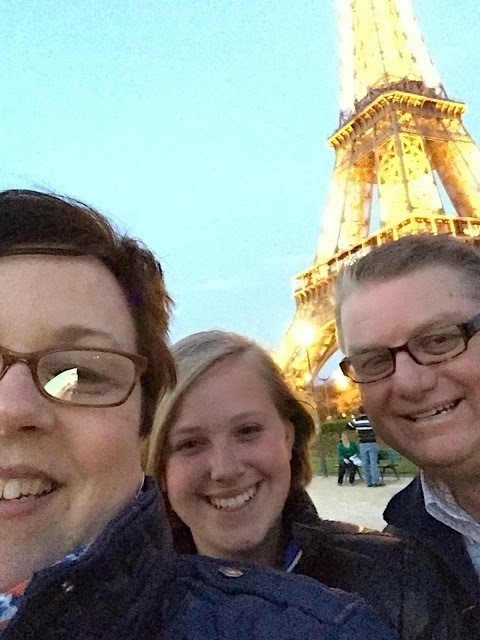 We ended our trip back at the Eiffel Tower to see it sparkle. It truly was a magical journey. Lest you think I am now sitting around enjoying the California sunshine, I am not. In just a few short hours I will be off on another adventure for a few days. I'll keep you posted! 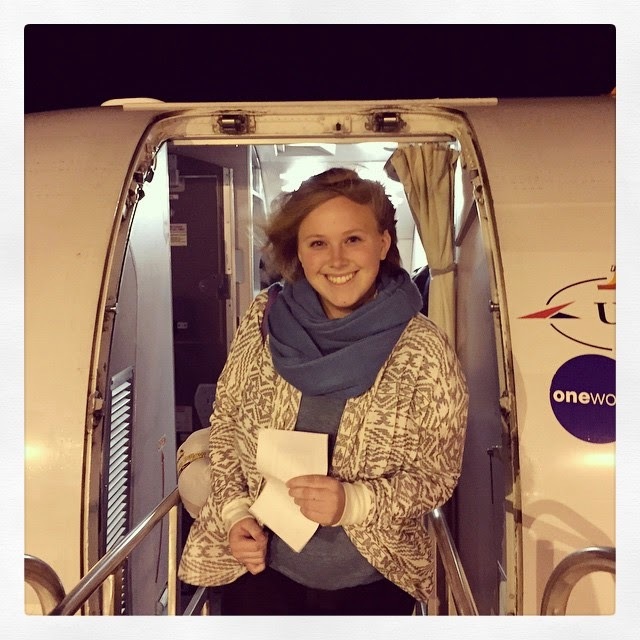 Thanks for sharing your adventure with us Paula! We went to London and Paris 6 years ago..now after seeing your photos I really want to go back! Wow! London and Paris are among a handful of places that I would love to visit. TFS Paula! If you didn't already wear so many hats, I think you would be a most excellent travel guide. 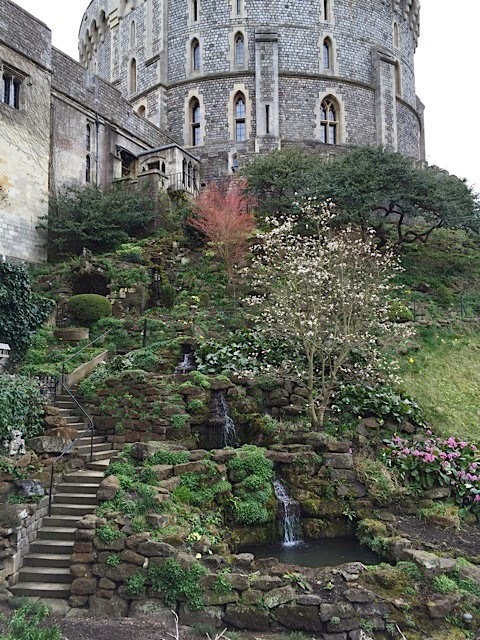 Really great photos and narration, my favorite is the garden steps at Windsor. You really took in quite a lot and what a lovely memories your niece is sure to have. 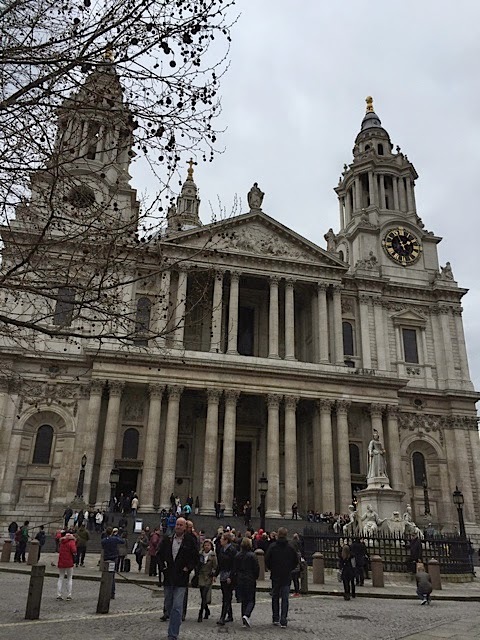 Paula, thanks so much for sharing pictures & commentary about your trip to London & Paris...I'm really impressed by how much you were able to see & do each day. What a wonderful experience to give your neice!